Full Service Yarn Shop: A Little Finished Object Dance, a Little Neh! Get yourself a plastic tub big enough to put your hand and arm up to the elbow in, and soak in warm epsom salts for 10 minutes at the start of each day. Great for strains. Wow -- you're churning out the knits. Make sure to knit something for yourself after the holidays, ok? Patience, that's a great idea. I'll try it. 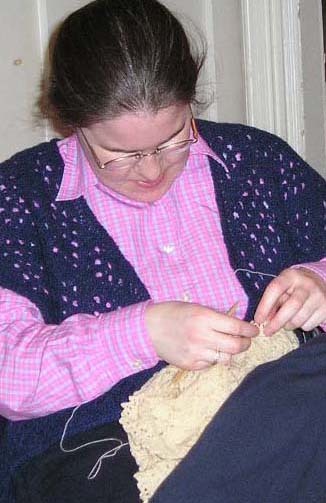 Meanwhile, I'm sitting here watching TV and not knitting. It's driving me CRAZY! Danielle, I have a whole stack of yummy, yummy sock yarn waiting for me when I get all this stuff done.